Close to the glitz and glamour of Puerto Banús and, yet, green and leafy enough to feel like the countryside, Nueva Andalucía really does offer everything you could wish for on the Costa del Sol. 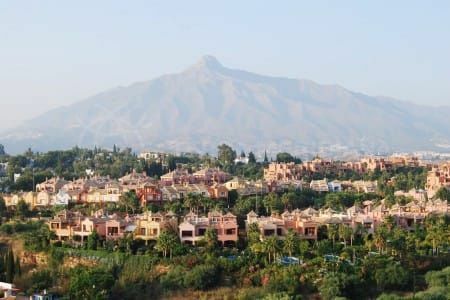 Overlooked by the dramatic peak of La Concha, Nueva Andalucía stretches inland from the N-340 coastal road up to the AP-7 toll highway, taking in parts of the municipalities of Marbella and Benahavís. Originally developed in the 1960s by Costa del Sol property magnate, José Banús, as an international tourism and golf destination, the area has matured gracefully and, today, is home to more than 15,000 people. Nueva Andalucía remains a mecca for golfers, with three world-class, championship courses to choose from: El Real Club de Golf Las Brisas was founded in 1968 and designed by the famous American course architect Robert Trent Jones Sr., who also designed the neighbouring Los Naranjos Golf Club, just to the north, which was inaugurated in 1977. Just few minutes’ drive away is the Javier Arana-designed, Aloha Golf Club, which has both a full 18-hole and 9-hole, par 3 rounds. With a mix of high-end mansions, detached villas, and spacious penthouses and apartments, some of which have coveted front-line golf and sea views, not to mention building plots still available in gated communities like La Quinta and La Cerquilla, Nueva Andalucía truly has something to suit every taste and budget. Properties of all sizes, from stunning, single-family residences in Bellevue; El Herrojo, in La Quinta; Las Parcelas del Golf, which borders Los Naranjos; and the Marbella Country Club, to equally exclusive apartment complexes, like La Alzambra, Las Alamandas, and Los Granados Golf, enjoy excellent Mediterranean and golf vistas and provide easy access to a whole host of amenities. As its name suggests, the Centro Plaza shopping, entertainment, and business complex lies at the centre of Nueva Andalucía, just north of the bullring. Anchored by a Supersol, it boasts three floors of shops, as well as 13 bars and restaurants, a gym and dance studio, and plays host to a weekly market every Saturday morning, with a wide selection of antiques, arts and crafts, clothing, and local produce. Just across the N-340, residents will find the Puerto Banus outlet of department store El Corte Inglés and the boutiques of Marina Banus. In terms of leisure and sports, Nueva Andalucía is never short of options for all kinds of pleasurable activities, from lounging in style at the slot machines and roulette tables of Casino Marbella, to more physical pursuits, like working up an appetite on the tennis and padel courts of the Manolo Santana Racquets Club Marbella. Once you’re feeling hungry, or simply needing a refreshment, the area has an extensive menu of places to eat and drink, as well as see and be seen, like its unofficial social hub, La Sala, and golf-course clubhouses. Fine dining choices like Nueva Campana, El Banco, and La Fontina, serve contemporary cuisine, while, if you have something more international in mind, French, Indian, Italian, Thai, and even fish and chips are all on offer. Those planning their next holiday, or planning to make visitors comfortable elsewhere, in Nueva Andalucía are also spoilt for choice in terms of where to stay, with all kinds of accommodation available, from the five-star Hotel Melía La Quinta Golf Resort and Spa and the four-star H10 Andalucía Plaza, to the more intimate surroundings of the Vasari Vacation Resort, in the La Alzambra development, and Sisu Boutique Hotel. So, whether you’re looking for a home near the coast or in the country, love playing sports or prefer the kind of game you can play sitting down, want to be close to the action without having to put up with the crowds, and dream of having every amenity on your doorstep, Nueva Andalucía really does have it all.